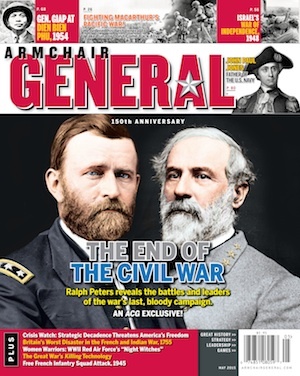 The History of Memorial Day | Armchair General Magazine - We Put YOU in Command! As the nation marks Memorial Day on Monday, May 25, 2015, Armchair General urges everyone to observe a moment of silence to remember and to honor the memory of the over 1.3 million men and women military servicemembers who have made the ultimate sacrifice in service to the nation from the Revolutionary War to today’s ongoing conflicts. On May 5, 1868, three years after the American Civil War ended, the head of an organization of Union veterans — the Grand Army of the Republic (GAR) — established “Decoration Day” as a time for the nation to decorate the graves of the war dead with flowers. Major General John A. Logan declared that Decoration Day should be observed on May 30. It is believed that date was chosen because flowers would be in bloom all over the country. Celebration of the first official Decoration Day at Arlington Cemetery, by John F. Jarvis, May 30, 1868. Stereograph shows President Grant and General John Logan seated at flag-draped reviewing stand. Library of Congress. Click to enlarge. The first large observance was held that year at Arlington National Cemetery, across the Potomac River from Washington, D.C. The ceremonies centered around the mourning-draped veranda of the Arlington mansion, once the home of Gen. Robert E. Lee. Various Washington officials, including Gen. and Mrs. Ulysses S. Grant, presided over the ceremonies. After speeches, children from the Soldiers’ and Sailors’ Orphan Home and members of the GAR made their way through the cemetery, strewing flowers on both Union and Confederate graves, reciting prayers and singing hymns. Today, cities in the North and the South claim to be the birthplace of Memorial Day in 1866. Both Macon and Columbus, Ga., claim the title, as well as Richmond, Va. The village of Boalsburg, Pa., claims it began there two years earlier. A stone in a Carbondale, Ill., cemetery carries the statement that the first Decoration Day ceremony took place there on April 29, 1866. Carbondale was the wartime home of GAR head Gen. Logan. Approximately 25 places have been named in connection with the origin of Memorial Day, many of them in the South where most of the war dead were buried. In 1966, Congress and President Lyndon Johnson declared Waterloo, N.Y., the “birthplace” of Memorial Day. There, a ceremony on May 5, 1866, honored local veterans who had fought in the Civil War. Businesses closed and residents flew flags at half-staff. Supporters of Waterloo’s claim say earlier observances in other places were either informal, not community-wide, or one-time events. By the end of the 19th century, Memorial Day ceremonies were being held on May 30 throughout the nation. State legislatures passed proclamations designating the day, and the Army and Navy adopted regulations for proper observance at their facilities. It was not until after World War I, however, that the day was expanded to honor those who have died in all American wars, not just the Civil War. In 1971, Memorial Day was declared a national holiday by an act of Congress, though it is still often called Decoration Day. It was then also placed on the last Monday in May, as were some other federal holidays. Daisies gathered for Decoration Day, May 30, 1899 at Washington, D.C. school, by Frances Benjamin, Johnston. Library of Congress. Click to enlarge. The crowd attending the first Memorial Day ceremony at Arlington National Cemetery was approximately the same size as those that attend today’s observance there, about 5,000 people. Then, as now, small American flags were placed on each grave—a tradition followed at many national cemeteries today. In recent years, the custom has grown in many families to decorate the graves of all departed loved ones. To ensure the sacrifices of America’s fallen heroes are never forgotten, in December 2000, the U.S. Congress passed and the president signed into law “The National Moment of Remembrance Act,” P.L. 106-579, creating the White House Commission on the National Moment of Remembrance. The commission’s charter is to “encourage the people of the United States to give something back to their country, which provides them so much freedom and opportunity” by encouraging and coordinating commemorations in the United States of Memorial Day and the National Moment of Remembrance. The National Moment of Remembrance encourages all Americans to pause wherever they are at 3 p.m. local time on Memorial Day for a minute of silence to remember and honor those who have died in service to the nation.